STOP POLICE MURDERS AND FRAME-UPS OF OUR BLACK YOUTH–JAIL KILLER COPS! 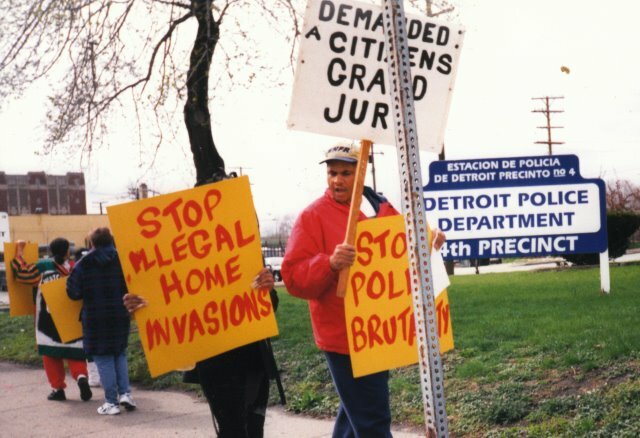 Cornell Squires (r) and supporters of his son and young cousins who had been framed up by “Robocop” William Melendez march on Detroit’s old 4th Precinct in 2000. This was 3 years before the feds charged Melendez and 17 other cops with running a Ramparts-style ring that terrorized the southwest side. Squires’ son was falsely accused of attempted carjacking; his young cousins’ home was invaded by Detroit police who planted drugs there. Squires’ son was tried before Judge Kym Worthy, who refused to acknowledge evidence that Melendez had already been charged with filing false reports. He served time in prison on the false charge. Atty. George Washington got the case against Squires’ cousins dismissed by an Appeals Court. Squires himself was previously assaulted by Detroit cop Robert Feld, as his son and father watched. His father had a heart attack which later proved fatal. Feld and Melendez worked together in the 4th Precinct at the time; Squires says his son’s frame-up was retaliation for his filing a report on Feld’s assault on him. 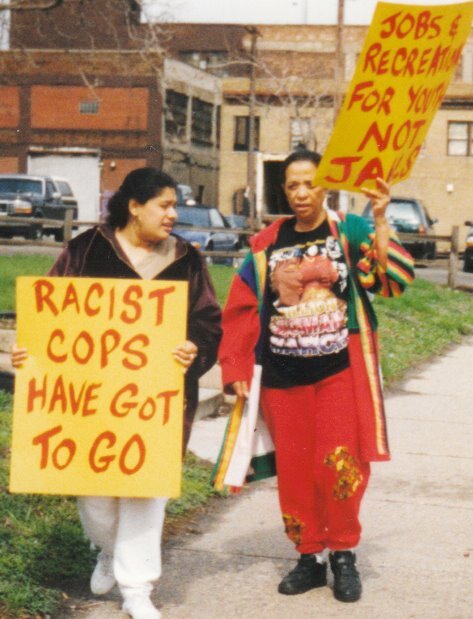 Some of the others who marched on the 4th precinct in 2000. The world is watching the United States of America. They see these young men of color are being assaulted, killed and incarcerated unjustly due to rogue cops lying and committing crimes because they feel privilege and are not being charged with these crimes! America has a double standard in our legal system and we must demand a new legal system immediately! This is also an unfair, hateful, malicious, ungodly and disrespectful system to our city’s residential homeowners and the taxpayers in our communities. Citizens’ human rights are being violated by rogue officers and homeowners are paying for these crimes they commit with increased of tax bills. Robert Feld today, Facebook. Forced to retire when video of him beating Mexican man surfaced. Rogue cops have no thoughts for human life. These officers are taking advantage of the taxpayers, citizenry who contributed hard earned money to pay taxes for good services. But Detroit’s local government can’t provide better services because of tax dollars being squandered, payid out for unnecessary illegal fees, continued lawsuits against repeat offenders know, as rogue cops. Detroit’s record speaks for itself. The rogue officers refusing to adhere to the same law citizen must follow, but then officials don’t enforce the law when rogue officers break it. All our residents must rise up! Detroit’s rogue cops cost taxpayers more money while the “good” officers are demanding higher salarIes, but will not speak out against the bad officers! Actually taxpayers are the real bosses for the police officers. The people actually paying taxes are the keepers of this city. Each time a rogue cop deliberately assaults a residents he/she is threatening the city payroll and possibly a pay cut in the near future to fellow employees especially after City just got out of bankruptcy! Police officers’ families may suffer more financial losses like the city has taken from the general city retirees’ pensions. 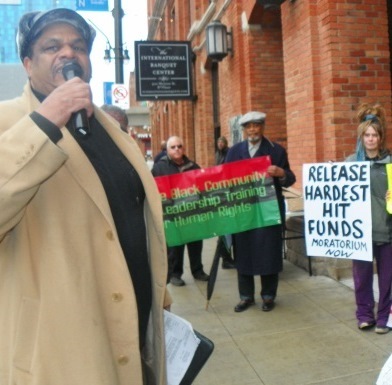 Cornell Squires speaks at protest against Wayne Co. tax foreclosures April 31, 2015. But rogue cops’ acts of brutality are hurting everyone in the cities and harming American families across this country. Residents pay higher taxes and water bills to compensate for the losses. The city of Detroit residents paid well over $100 million dollars in the past 25 years because of police misconduct. This happens because leadership is unjust and doesn’t uphold law equally. The past and current Wayne County Prosecutors should be held accountable and responsible for rogue cops’ conduct and action over the past 25 years because they refused to bring charges against those officers! 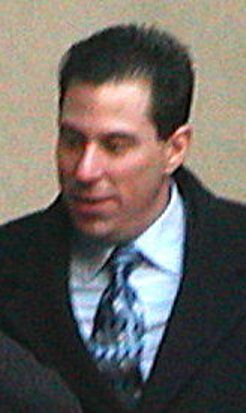 Many rogue cops are repeat offenders, just like “Robocop” William Melendez who assaulted Floyd Dent, which was captured on police dash cam in January 2015. Floyd’ Dent was assaulted by police and then they planted drugs in his car. Robocop, then an Inskter police officer, once worked for city of Detroit police department and cost city tapayers a millions of dollars in civil lawsuits for wrongful death, assaulting city residents and framing numerous citizens, as he did with my son. He has only ever been charged for filing a false police report, which he also did in my son’s case. 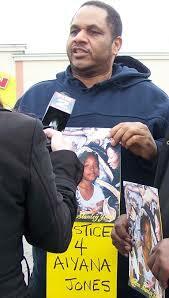 Squires at protest of Detroit police killing of Aiyana Jones, 7, in 2010. 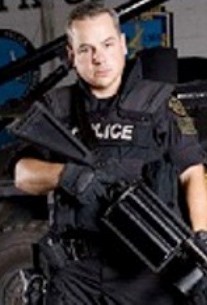 Aiyana’s killer Joseph Weekley on ad for “Detroit SWAT” TV show. He is now back on force. Detroit paid out the highest lawsuit awards for wrongful death caused by police misconduct in the 1990’s per capita. Many times rogue officers transfer to another police department after being reprimanded of fired for committing crime(s), and get hired there. Normally prosecutors will not charges police officers with perjury or assult charges like average citizens are charged. The injust killings of Black citizens continues today just like it was 50 years ago. Only a few cops have ever been brought to justice for assulting or killing U.S citizens, but received minor reprimands or little punishmen. Looking at the historical prospective in America our ancestors were unjustly killed by police officers and no police officers were ever criminally charged for murdering our ancestors. Now our new generation is faced with being murdered in American streets in same racist attacks done to the ancestors and communities, mostly killing Brown and Black men. 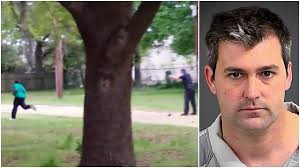 North Charleston, SC cop Michael Slager (r) killed Walter, unarmed, 50, and a Coast Guard retiree, father of four, as he ran from being tasered. Many people have seen the video on the news about the S.C. man running from the scene and the police officer shot him in the back numerous times, killing him. But what crime was committed ? Did the man commit a felony ? I thought police officers could only persue a fleeing felon. Did his crime constitute or warrant the police officer shooting a human being in his back? 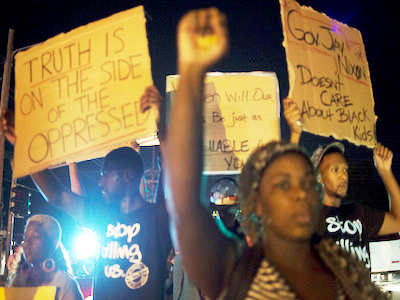 Why are so many Black men are being killed by police officers in the United States today? Why? But the U.S Federal or State prosecutor’s are not charging police officers with any crime! Should the prosecutors’ offices in America be held LIABLE? These young men killed are human beings and were created in God’s image likeness. Where is humanity? God loves them the same way he loves police officers, but God hates evil. Where’s America truthful churches? Is there a such thing as a true church, who always say that God is good all the time, while our brothers and sisters need our help! The killing of Black men must STOP because it is wrong and sinful! Where is America’s leadership? Now so many candidates are running to for president of the U.S. What’s their precise plan to stop police brutality? Before you vote the next presidential election remember “Black Lives Matter” Where are the righteousness peoples on the earth? The faith community? The church peoples says, One Lord One faith One Bapstim for ALL Us Ephesian 4:6 But faith-based communities are to quiet today? Everyone that God fearing in America should step up to plate, and denounce this Gross Injustices in United States of America speak out about Rogue Police Officers. Come out from among them” unity together for righteousness sake, peace, love, harmony for the lost H tribes of young Americans! God, our children need our support ! ! ! ! ! ! ! ! ! ! ! Recent Chicago protest over police killings of unarmed Black, Latino, and poor people. Chicago police were cited by the UN as one of the most brutal forces. They also attacked this protest. One Response to STOP POLICE MURDERS AND FRAME-UPS OF OUR BLACK YOUTH–JAIL KILLER COPS! ~ And good ones sometimes feel like they have to also and break their own code of ethics and conduct to cover for the bad ones. Or otherwise be labeled a rat and face retaliation.